Opening this week, Taproot will bring a true taste of Connecticut to the plate punctuated with Southern and global influences in a down-to-earth setting. Nearby farms, producers, and foragers dominate a hyper-local and evolving menu—this result is an unpretentious and welcoming chef-driven dining experience soon to be situated in the quaint northern Fairfield County town of Bethel. Why this focus on local? It’s not a trend to chase for Jeff Taibe and Steph Sweeney, Taproot’s partners who live in Bethel and are raising their family there. They chose the charming former restaurant space next to the independent Bethel Cinema to “do what we love and spend more time with family,” explains Jeff. “We love the town and how it is growing. We wanted to put our touch on it.” Jeff and Steph will be a steady presence in the restaurant, with Steph managing the front of the house and Jeff, in the kitchen. They are working hard to cultivate a welcoming and community-minded restaurant, the type of place you'll want to dine at frequently. 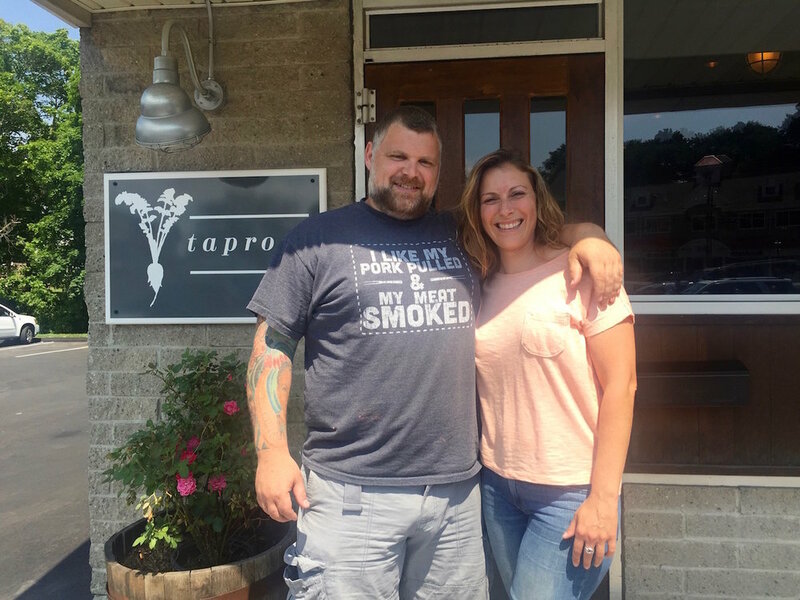 Behind Taproot’s charm is the hardworking duo of Jeff and Steph, familiar faces in Fairfield County restaurant industry. Jeff has worked as a chef for the past sixteen years in Asia, the Caribbean, and recently at Oak and Almond in Norwalk and Kawa Ni in Westport. Steph grew up in Bethel and honed her food service experience at the Redding Country Club for a decade before spending the last several years in Westport working at Whelk, Kawa Ni, and Jesup Hall. Jeff acknowledges Taproots menu will evolve as the season’s change and he experiments with new ingredients. The menu is constructed for sharing, a nod to the desire to create a community with “for the table,” “small plates,” and “large plates” designations. The most shareable dishes include “uni and olive oil” with smoked salt and bread, house made terrines and cured meats, and pimento cheese with country jam. Small plates will include raw fish and meat dishes, a variety of greens and salads, and a focus on seasonal vegetables. Larger places will regularly feature Jeff’s take on the burger, a lamb patty melt, and other entrees that depend on the animals Jeff is able to secure. As for drink, a full bar with 5-6 craft cocktails, as well as a selection of craft beer and wine, both sourced locally and globally, will be rotated regularly. The setting reflects the food. Rustic hand made touches fill a welcoming dining room, paying homage to local artisans, or what Jeff Taibe refers to as “hidden artists.” These details include custom dinnerware pottery, lighting and tiling, as well as corrugated metal ceiling tiles reclaimed from a 100 year old barn. The result is an intimate space—what feels like an extension of Jeff and Steph’s own home. Taproot will open on or around July 11. Located next to the Bethel Cinema, the restaurant will be open for dinner to start, Tuesday through Saturday. Taproot will also plan to offer special dinners on Sundays.